HIS favourite weapon was lunch, and he deployed it almost every day. Seated opposite a well-informed companion in L’Ecu de France, halfway between Fleet Street and Whitehall, Chapman Pincher would go hunting for scoops. Notes were never taken, and drink only rarely. After all, a pen could spook a companion into silence and anyway, his memory was sufficient. Letting his guest do the drinking meant he would also do most of the talking. An occasional prompt was enough to lubricate the conversation. There was no need for the aggressive, impatient approach he disliked in modern reporters. The stories he dug up for the Daily Express, where he worked for 33 years, were about state secrets, atomic weapons and spy scandals. They so annoyed the government that Harold Macmillan, prime minister from 1957 to 1963, wrote a letter asking if anything could be done “to suppress or even get rid of” the irritating hack. Mr Pincher was proud of that: he had the letter framed and hung it on his bathroom wall. E.P. Thompson, a historian, dismissed him as “a kind of official urinal in which, side by side, high officials…stand patiently leaking in the public interest”. That was taken as a compliment, too. 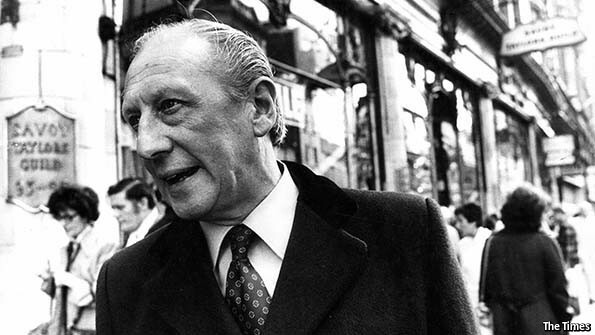 It amused him to learn, years later, that L’Ecu de France had been bugged by both MI5 and the KGB. He was lucky, he said, to have had a career that coincided with the chilliest bits of the cold war. It was the age of Soviet spy rings at Cambridge, of traitorous scientists trading in nuclear secrets, and of the Profumo affair, in which the secretary of state for war was revealed to have been sleeping with the mistress of a Soviet naval attaché. Secrets and paranoia were in the air, and the waning of Britain’s culture of deference meant that the papers were increasingly willing to print them. The son of a publican, Mr Pincher worked behind his parents’ bar as a teenager, honing an ability to chat with people at all levels of society. That served him well: hunting and shooting trips with ministers and aristocrats provided rich pickings. He came to detest reflexive, unnecessary secrecy, an attitude he traced back to an incident in 1943, when he was serving in the army. One day he was handed a message stamped “secret”, informing him that “tinned sausages are now available.” He tried to crack the code—did “tinned sausages” refer to German troops, perhaps?—before discovering, with some disgust, that it simply meant exactly what it said. His big break came when he obtained early technical details about the atomic bomb that had been dropped on the Japanese city of Hiroshima. Later, he covered the case of Klaus Fuchs, a Manhattan Project scientist who passed information to Moscow. In 1967 he reported, to general outrage, that Britain’s spy agencies were reading the cables and telegrams of its private citizens. An article in 1971 suggested that dozens of gardeners, chauffeurs and the like employed at the Soviet embassy were in fact spies; they were swiftly expelled. A biologist by training, he also covered science. In 1954 he broke the story (to much derision, not least in the Express’s own fuggy offices) that scientists had linked smoking with lung cancer. But paranoia is an occupational hazard in espionage, and Mr Pincher was not immune. Later in life, he became obsessed with trying to prove that Sir Roger Hollis, a former head of MI5, had been a Soviet spy. One of his sources was Peter Wright, an ex-MI5 officer who made similar allegations in his book “Spycatcher”, which the government tried to have banned. (Another, reputedly, was James Jesus Angleton, a notoriously paranoid CIA counter-espionage expert.) An internal investigation turned up no evidence against Hollis; the Soviet archives, which were briefly opened after the end of the cold war, revealed that the Soviets were as baffled by the accusations as Hollis was. Nor were the government’s frustrations entirely unjustified. Occasionally his stories did real damage: one, in 1953, nearly exposed a plan for Britain and America to share intelligence on the Soviet nuclear programme. But he saw himself as a patriot who would expose those who were betraying their country. Just occasionally—whether because of that patriotism, or in exchange for a juicy titbit later—he could be persuaded to co-operate. In 1957, at the government’s behest, he wrote a deliberately misleading article to deter protests by Japanese fishermen against Britain’s first test of a hydrogen bomb. He loved journalism, possibly more than he loved his family (he regretted not spending more time with his children). But he never quite fitted in on Fleet Street, and not just because of his aversion to booze. Most reporters are pack animals, but he actively avoided their company, revelling in the nickname of “the Lone Wolf”. Colleagues on the Express complained that he was not above poaching their copy if he felt that a colleague was straying onto his patch. Other critics called him naive, saying that his sources often used him to advance their own bureaucratic agendas. He knew that perfectly well, of course. But, as he sat on his doubly-bugged banquette, listening to another contact spilling secrets, he simply didn’t care. As long as it was news—and especially if it was an exclusive—he would publish it regardless. This article was published in The Economist on 13th August 2014. See this link.